They pop up on TV news programmes everywhere in the UK and US like pimples or in some acute cases like suppurating boils. Well, not everywhere: everywhere there’s been an incident in what are known as ‘deprived areas’. You name it, a racial attack, a riot, or a dog has mauled somebody. They’re the species beloved of TV reporters, the Greater Brass-necked Community Leader ever ready with a comment, a sound bite and the obligatory pronouncement that ‘the whole community is devastated’. Of course there’s no official position of community leader. It’s a self-appointed role, be it in Charleston, Bradford or Belfast. In the north they’re a problem because of the status they have acquired over the years particularly in loyalist districts where they are a blight on society. Anyone from the ‘community’ who pointed out the ‘leader’s’ absence of credentials would get his or her head kicked in because almost universally the ‘community leader’ has gained that title due to his (and it’s invariably a man) role in the UVF or UDA. The subversion of community groups began a long time ago when the IRA announced at Bodenstown in 1977 a new policy of involving themselves in politics at street level through a new branch of the republican movement they called the civil administration. By the time of the hunger strikes in 1981 the republican movement had taken over community groups and tenants associations in republican districts in west and north Belfast, the Bogside and Creggan and similar places across the north. Loyalists copied the model. The British encouraged them. The critical difference was that by 1985 Sinn Féin represented all those districts on local councils because people elected them and their councillors genuinely were ‘community leaders’. Not so in loyalist districts where the people loathed, despised and feared the UVF and UDA front men. How do we know? Simple: when they stood for election they couldn’t even get the members of their own organisations to vote for them. The best ever showing for UVF/UDA fronts was in 1998 when they got three per cent of the vote. That didn’t faze them one bit. They battened on like parasites strangling a healthy plant. Why? Money, and besides, it’s better than work. You’ll find many of these ‘community leaders’ have no qualifications and often a conviction prevents them getting a real job. They are as thick as champ but compensate with sly native cunning and an eye for the main chance, namely their own financial advancement. Professional community workers with formal qualifications run council community centres. Mind you, that doesn’t stop the ‘community leader’ inserting the occasional yahoo from his own organisation into the role of community worker in the same centre. The most outrageous aspect of this appalling arrangement is that it’s government funded whether council run or not. Has been for forty years. What that means is that councils, the assembly and that NIO front, the Community Relations Council, subsidise the UDA and UVF by employing their bosses and local henchmen. In practice it’s danegeld. From time to time if the local ‘community leader’, let’s be honest and call him the gang boss, decides his money stream is threatened he organises disturbances, what the ever insightful Newton Emerson calls ‘grant applications’. Basically it means, gimme more money or I’ll wreck the place. It always works. It works mainly because of the cowardice, dishonesty and stupidity of policing strategy for the last umpteen years. 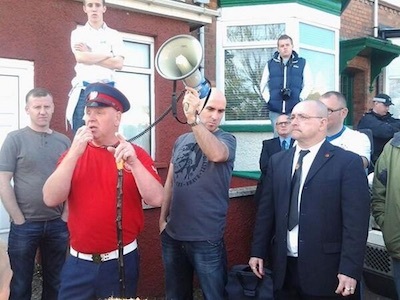 When police say they’re consulting ‘the local community’ about removing flags or bonfires they mean they’re pleading with the local UDA or UVF gang boss who represents no one. They ignore elected representatives because they’re ‘useless’. Why? Because the police and NIO have been appeasing loyalist bosses for decades thereby undermining the people the community elects. Usually that leaves councillors with no alternative but to collude in the appeasement and continue to pay danegeld in hard cash or political credibility. The majority of the community would love to get these gangsters off their backs. They watch in despair and resignation as the police pay them obeisance instead of arresting them and putting them out of business and the council pays them to destroy the community.